For a lot of HTML forms you really don’t need much more than the basic form fields that HTML provides. For some projects however you might need a little more. 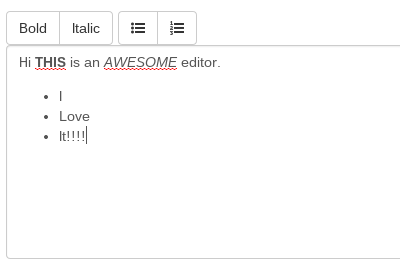 If you want your users to be able to add some styling, formatting or links you’re likely to use a third party editor like CKEditor or TinyMCE. Both of these are fine if you need all of the cool features they provide but sometimes those are overkill. What if you simply want bold, or italic features and maybe ordered and un-ordered lists? WYSIHTML5 makes it pretty simple. You can grab WYSIHTML5 from Github. To add a little style we’ll use Twitter’s Bootstrap framework and Font Awesome icon fonts. Copy the WYSIHTML5 files into the correct directories. ‘wysihtml5-0.3.0.js’ can be found in the ‘dist’ directory and ‘advanced.js’ in the ‘parser_rules’ directory. Now to integrate WYSIHTML5 all you need to do is include it in our page along with Bootsrap and Font Awesome. Now we can build the form with our editor. There is slightly more coding involved with integrating WYSIHTML5 than some other editors but this allows us to be more flexible. You should now have a nice clean but functional editor that looks like this.